Patients at Manatee Memorial Hospital can get all the advantages of minimally invasive, advanced robotic surgery because our experienced physicians at the Surgery Center use the da Vinci® Surgical System. This minimally invasive technique helps reduce pain and trauma to the body, lessens blood loss, lowers risk of infection, shortens length of hospital stay and promotes quicker recovery with less scarring. The da Vinci® Surgical System allows surgeons to maneuver into confined spaces within the body with 3D magnification while providing a greater range of motion and precision with specialized instruments. 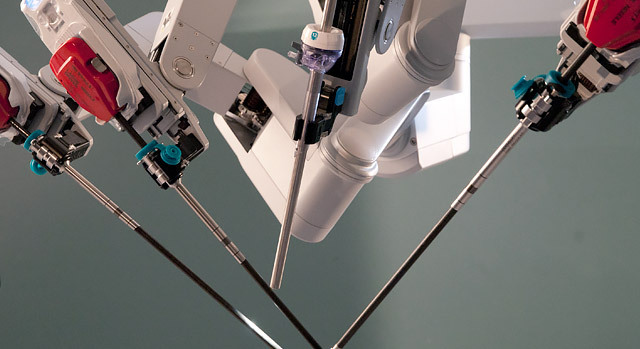 Manatee Memorial Hospital was the first in Manatee County to offer minimally invasive robotic-assisted surgery using the da Vinci® Surgical System. Manatee Memorial Hospital was the first in Manatee County to offer EsophyX™, a surgical choice for the treatment of gastroesophageal reflux disease (GERD), or heartburn, without making any incisions in the patient’s body. The EsophyX device is inserted into the body through the patient’s mouth using a standard endoscope, not through an incision. That means patients have no external skin incisions, no internal cutting, fewer adverse effects or complications and quicker recovery times. Studies show an 80 percent improvement in quality of life and the reduction or elimination of heartburn symptoms among patients who have had the procedure. For more information about Robotic Surgery, call our Robotic Coordinator, Jody Burdge, RN at 941-745-7514.